KARACHI: Sindh Chief Minister Syed Murad Ali Shah hosted a reception in honor of the spiritual leader of Ismaili community Prince Karim Aga Khan at the CM’s House on Sunday. Pakistan People’s Party (PPP) chairman Bilawal Bhutto Zardari also attended the event. While welcoming the visiting dignitary to Pakistan, the Sindh chief minister said that it was indeed an immense honour for him to host the spiritual leader at the CM’s House. Syed Murad Ali Shah also thanked Bilawal Bhutto for taking time to attend the reception despite his busy schedule. Published in Daily Times, December 18th 2017. KARACHI: Sindh Chief Minister Syed Murad Ali hosted a reception in honour of Spiritual leader of Ismaili Community His Highness Prince Karim Aga Khan here at CM’s House. The chief minister welcoming His Highness to Pakistan, said that millions who eagerly awaited his arrival rejoice as he graced them with his presence, as a part of his golden jubilee. He said that it was indeed an immense honor for him to host His Highness at CM House, said a statement here Saturday. “The contributions that you and your family have made to Pakistan are countless; even before we were recognized by the international community as a sovereign state, His Highness Aga Khan the third drove us towards gaining independence during the Round Table Conferences, where he advocated to put Pakistan on the map,” he said and added today, the philanthropic work done by the Aga Khan Development Network reaches millions across the nation, and Pakistan is indeed fortune to have been a beneficiary of the humanitarian work undertaken by the AKDN. Murad Ali Shah while lauding his efforts towards global peace and stability said “You have propagated only the unity of mankind, and have been rendering an invaluable and self service for all humanity, as you offer tolerance and understanding, acceptance and affirmation and harmony and unity-in these dark and dreary times” . The chief minister also welcoming Chairman PPP Bilawal Bhutto Zardari thanked him for taking time to attend the reception despite his very busy schedule. The President Ismaili National Council for United Kingdom [UK] Liakat Hasham, leaders of United Kingdom [UK] and European Ismaili leadership conveyed their appreciation and admiration to the Pakistani Government while talking with the Ambassador of Pakistan in Denmark Zulfiqar Gerdezi for the current Diamond Jubilee visit of His Highness Prince Karim Aga Khan to Pakistan so far. The Ambassador of Pakistan conveyed his admiration and respect for the contribution of His Highness Prince Karim Aga Khan [the current Imam of Ismaili Imamat] and AKDN for the development of Pakistan and elsewhere. The exemplary harmony among all the Muslims in Gilgit Baltistan [GB] during the various Darbars was specially recognized by the global Ismaili Jamat and hope that this unity and collaboration will continue for the betterment of the future generations. This he said while addressing a reception he hosted in honour of Spiritual leader of Ismaili Community His Highness Prince Karim Aga Khan at CM House. The chief minister welcoming His Highness to Pakistan, said here millions who eagerly awaited his arrival rejoice as he graced them with his presence, as a part of his golden jubilee. He said that It was indeed an immense honor for him to host His Highness at CM House. 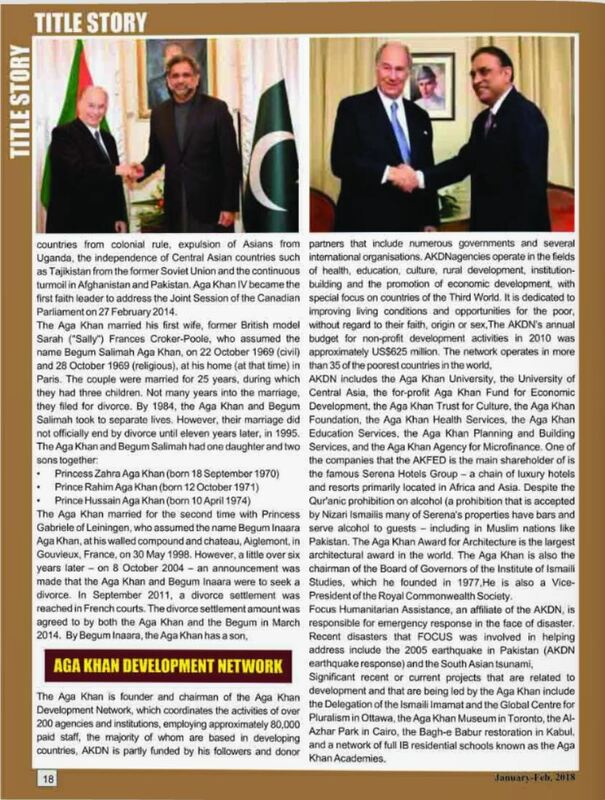 “The contributions that you and your family have made to Pakistan are countless; even before we were recognized by the international community as a sovereign state, His Highness Aga Khan the third drove us towards gaining independence during the Round Table Conferences, where he advocated to put Pakistan on the map,” he said and added today, the philanthropic work done by the Aga Khan Development Network reaches millions across the nation, and Pakistan is indeed fortune to have been a beneficiary of the humanitarian work undertaken by the AKDN. Murad Ali Shah said today, we live in trying times; Muslims at large are misunderstood and persecuted, and have become victims of ignorance and bigotry. “The voice of the moderate and the tolerant is getting weaker and we are engulfed in what most consider a Clash of Religions, or as you put it, the ‘ Clash’ of ignorance’ – because indeed, that is exactly what it is,” he said and added “And it is only when this darkness of ignorance is defeated by the light of education that we will experience any lasting change,” he said. The chief Minister lauded the efforts towards global peace and stability. “You have propagated only the unity of mankind, and have been rendering an invaluable and self service for all humanity, as you offer tolerance and understanding, acceptance and affirmation and harmony and unity-in these dark and dreary times,” he said. The chief minister also welcoming Chairman PPP Bilawal Bhutto Zardari thanked him for taking time to attend his reception despite his very busy schedule and also congratulate him on a historic jalsa in Multan yesterday. The visit began in Islamabad, where Mawlana Hazar Imam met with President Mamnoon Hussain at Aiwan-e-Sadr and was received by a Guard of Honour. He also met with Prime Minister Shahid Khaqan Abbasi, who presented him with a First Day Cover of commemorative stamps on the occasion of his Diamond Jubilee. From Islamabad, Mawlana Hazar Imam travelled to Garamchasma and Booni in Chitral, and Aliabad and Taus in Gilgit-Baltistan, where he granted the Jamats there with Diamond Jubilee Darbars. Mawlana Hazar Imam then returned to Islamabad where he met with the Jamat at the Karimabad Jamatkhana and then travelled to Karachi where he met with the Jamat at the historic Darkhana Jamatkhana and Clifton Jamatkhana. While in Karachi, in his capacity as chancellor of the Aga Khan University, Mawlana Hazar Imam inaugurated the AKU Centre for Innovation in Medical Education, a state-of-the-art facility for technology-based learning for health professionals. Upon Hazar Imam’s departure, Chief Minister of Sindh Syed Murad Ali Shah bade him farewell on behalf of the government, whilst the Jamat was represented by the Jamati and AKDN leadership of Pakistan. This visit provided a unique opportunity for thousands of volunteers in Pakistan to come together in preparation for the historic occasion and hundreds of thousands to gather for the Diamond Jubilee Darbars and meetings with the Jamat, leaving behind memories that will last a lifetime. His Highness Prince Karim Aga Khan, the 49th Imam of the Shia Ismaili community, is visiting after many years and his arrival has sent a wave of happiness in the entire community. “Our community cards were made about a month back,” says Aly, a shop owner. “Everyone from the community has a card, just like the national identity card with all his or her information. This is only for the community. It is required for security purposes, too,” he says. Asked about the last time he had presented himself before the Aga Khan, Aly smiles shyly and says that he has no recollection of it. “I was a baby in my mother’s arms then. I don’t remember,” he says. There are many framed photos of Prince Karim that grace the walls of a photo shop across the Jamaatkhana in Clifton but the one of him with his horse that has remained there for a long time is missing. The shopkeeper says that he only recently sold the print. “Many of my other prints of his pictures have also been bought recently,” he says happily. When asked if he thought the sudden rise in sales of the Aga Khan’s pictures is connected to his visit, the man nods happily. “I saw His Highness when he was here 17 years ago with my eldest child in my arms,” says Firoze, the shop owner. “My son was only a few days old then. But he is 17 now and I am glad he will see and remember him now,” he says. “My other two children are also old enough to remember the moment,” he says, adding that his second son is 15 and youngest, a daughter, is 11. Asked if custom requires them to wear a particular dress or jewellery for the girls as it is after all a moment of joy to have their leader among them, he quickly shakes his head. “First of all, our community doesn’t have any particular dress. As for jewellery, how will it look when the metal detectors are going off every other second?” he says and laughs. “You have to be sensible,” he adds. “It is great to have our spiritual leader here after all this while. And the entire community knows this,” a senior community member told Dawn. When asked if the celebrations included serving special dishes, he just laughs and shakes his head. “We have no special dish or food. We eat what you eat. We break bread just like you. We are one of you,” he explains. 2018-01-10 - This year 2018, The January issue of the Asian Times cover page is dedicated to the Diamond Jubilee of H.H. The Aga Khan, our Imam-e-Zaman. A souvenir for all the Ismailis, worth keeping a copy anong all the memorabilia of this Jubilee! In preparation for Mawlana Hazar Imam's Diamond Jubilee visit, the Ismaili Centre Dubai is vibrant with activity and excitement. Mawlana Hazar Imam will be visiting the United Arab Emirates on the official invitation of Sheikh Mohammed bin Rashid Al Maktoum, Vice President and Prime Minister of the UAE and Ruler of Dubai. During his visit, Hazar Imam will meet with the UAE Jurisdiction Jamats. Diamond Jubilee Visit Celebrations officially commenced today at the Ismaili Centre, Dubai. The courtyard was transformed to host Mulaqat Mela, where members of all ages joined in activities including calligraphy, dance and musical performances, card making, tasbih making, dandiya decorating and face painting in celebration of the forthcoming visit. Festive balloons, joyous music and the sweet scent of delectable snacks welcomed the Jamat all day. A spirit of unity and joy emanated through the air and was evidenced by the smiles on the faces of children and adults alike. As we continue to prepare for this historic event, a UAE Visit site has been launched on The.Ismaili to keep the UAE Jamat up-to-date with key details of the event, including venue and transport information. To stay informed of all the latest news, videos, and photographs, follow us on social media (Facebook, Twitter, Instagram) and sign up for email updates. 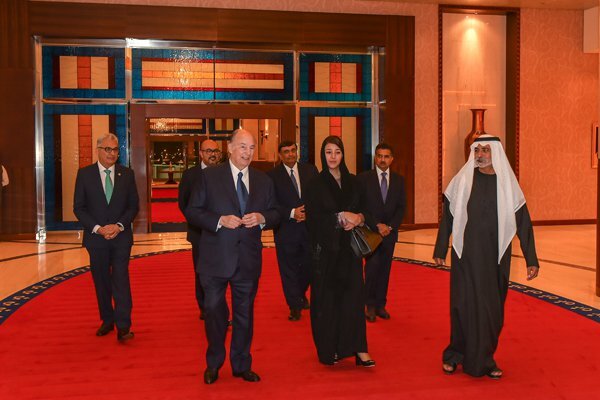 Dubai, UAE, 22 January 2018 - His Highness the Aga Khan, spiritual leader of the Shia Ismaili Muslim Community arrived in Dubai this evening on an official visit at the invitation of His Highness Sheikh Mohammed Bin Rashid Al Maktoum, Vice President and Prime Minister of the UAE and Ruler of Dubai. While in the UAE, Mawlana Hazar Imam is scheduled to meet with government leaders to discuss further cooperation in areas of mutual interest. During this most historic Diamond Jubilee visit, Mawlana Hazar Imam is also expected to grace the Jamat with a Darbar. He arrived in Dubai at the invitation of His Highness Sheikh Mohammed bin Rashid Al Maktoum, Vice President and Prime Minister of the UAE and Ruler of Dubai. His Highness the Aga Khan, spiritual leader arrived in Dubai this evening on an official visit at the invitation of His Highness Sheikh Mohammed Bin Rashid Al Maktoum, Vice President and Prime Minister of the UAE and Ruler of Dubai. Upon his arrival, His Highness was welcomed by His Excellency Sheikh Nahayan Mabarak Al Nahayan, Minister for Tolerance and Her Excellency Reem Ebrahim Al-Hashimi, Cabinet Member and Minister of State for International Cooperation. Mawlana Hazar Imam arrived in Dubai on the evening of 22nd of January, 2018 on an official visit at the invitation of His Highness Sheikh Mohammed bin Rashid Al Maktoum, Vice President and Prime Minister of the United Arab Emirates and Ruler of Dubai.&#8232;&#8232; Over the next few days, Mawlana Hazar Imam is expected to meet with government officials, as well as the Jamat of the UAE. The Vice President, Prime Minister and Ruler of Dubai, His Highness Sheikh Mohammed bin Rashid Al Maktoum, received Mawlana Hazar Imam today at the Zabeel Palace on the occasion of his Diamond Jubilee visit to the United Arab Emirates. Vice-President and Prime Minister of the UAE, and Ruler of Dubai His Highness Sheikh Mohammed Bin Rashid Al Maktoum received today in Zabeel Palace, Aga Khan, Imam of Nizari Ismailism. Deputy Ruler of Dubai HH Sheikh Maktoum bin Mohammed bin Rashid Al Maktoum attended the meeting. Sheikh Mohammed and the visiting guest discussed various humanitarian and philanthropic topics. DUBAI, 23rd January, 2018 (WAM) -- The Vice President, Prime Minister and Ruler of Dubai, His Highness Sheikh Mohammed bin Rashid Al Maktoum, today received Aga Khan IV, Imam of the Shia Ismaili Muslims, in the presence of H.H. Sheikh Maktoum bin Mohammed bin Rashid Al Maktoum, Deputy Ruler of Dubai. The Aga Khan is visiting Dubai as part of a diamond jubilee tour marking 60 years as spiritual leader of the Shia Ismaili Muslim community. Shortly after arriving in the UAE, the Aga Khan was welcomed by Sheikh Nahyan bin Mubarak, Minister for Tolerance, on Monday and Sheikh Mohammed bin Rashid Al Maktoum, Vice President and the Ruler of Dubai, and Reem Al Hashimi, Minister of State, on Tuesday. The tour is celebrating six decades of global engagement with cultural, economic and social development effort to improve the lives of people around the world in the Aga Khan Development Network. The Aga Khan has been deeply engaged with cultural, economic and social development efforts to improve quality of life for people in countries around the world. He has also been a strong advocate for an improved understanding of Islam and for fostering brotherhood within the Ummah. The Aga Khan has also advocated for dialogue and cooperation among faith communities through the advancement of education, music and culture. The Aga Khan acceded to the Ismaili Imamat on July 11, 1957, succeeding his grandfather, Sir Sultan Mahomed Shah Aga Khan. Over the last 60 years, the Aga Khan has been deeply engaged with cultural, economic and social development efforts to improve quality of life for people in countries around the world through the work of the Aga Khan Development Network, which today serves millions of people in more than 35 countries. The Aga Khan has been a strong advocate for an improved understanding of Islam and for fostering brotherhood within the Ummah, as well as dialogue and cooperation among faith communities through the advancement of education, music and culture. Sheikh Nahayan Mabarak Al Nahayan, UAE Minister of Tolerance, is the Honorary Chairman of the Gulf and South Asia Patrons Circle of the Aga Khan Museum. Sheikh Nahayan and Ms Reem Ebrahim Al-Hashimi, Cabinet Member and Minister of State for International Cooperation, welcomed the Aga Khan when he arrived in Dubai. The Aga Khan was invited to the United Arab Emirates by Sheikh Mohammed Bin Rashid Al Maktoum, Vice President and Prime Minister of the UAE and Ruler of Dubai. In 1977, the Aga Khan established the $1 million Aga Khan Award for Architecture awarded every three years to projects that are judged to set new standards of excellence while addressing the needs of communities in which Muslims or Islamic heritage have a significant presence. Its 13th cycle was held in Al Ain, Abu Dhabi, in 2016. Last year, under the mentorship of the Aga Khan Award for Architecture, a new education initiative – the Young Architects and Design Programme – was established in partnership with Alserkal Avenue. Tuesday, January 23, 2018 | 11:49 p.m.
DUBAI: The Vice President, Prime Minister and Ruler of Dubai, His Highness Sheikh Mohammed Bin Rashid Al Maktoum, on Jan.23, received Aga Khan IV, Imam of the Shia Ismaili Muslims, in the presence of Sheikh Maktoum Bin Mohammed Bin Rashid Al Maktoum, Deputy Ruler of Dubai. The Vice President, Prime Minister and Ruler of Dubai, His Highness Sheikh Mohammed Bin Rashid Al Maktoum, on Jan.23, received His Beatitude John X, Greek Orthodox Patriarch of Antioch and All the East, and his accompanying delegation, at Zabeel Palace. Sheikh Maktoum Bin Mohammed Bin Rashid Al Maktoum, Deputy Ruler of Dubai, was present. During the meeting, Patriarch John X expressed his thanks and appreciation to Sheik Mohammed for the facilities granted by the UAE to the Christian communities and their followers, who live in the UAE community in peace, security, and are fully free to practice their religious rites like others. Patriarch John X also praised the cultural and humanitarian achievements of the UAE people, as part of the country’s leadership keenness to provide a safe and dignified life to its people and the bring happiness to its citizens and society in general. He also lauded the good reputation enjoyed by the UAE in the global financial, economic, political and religious circles thanks to the balanced policy pursued by the leadership and the government in this respect. “Our country welcomes all those who seek security, stability and happiness whether to live, invest or work. All are equal under the cloak of the law. We, as a leadership, government, people or institutions, have no discrimination between nationality or culture, and we have about 200 nationalities living in our society, happily and equal in duties and rights,” Sheikh Mohammed said. Sheikh Hamdan Bin Mohammed Bin Rashid Al Maktoum, Crown Prince of Dubai and Chairman of Dubai Executive Council, and Sheikh Maktoum Bin Mohammed Bin Rashid Al Maktoum, Deputy Ruler of Dubai, were present. The meeting was attended by Sheikh Ahmed Bin Saeed Al Maktoum, Chairman of the Dubai Civil Aviation Authority and Chief Executive of Emirates Group and Sheikh Ahmed Bin Mohammed Bin Rashid Al Maktoum, Chairman of the Mohammed Bin Rashid Al Maktoum Knowledge Foundation. It was also attended by Reem Bint Ibrahim Al Hashimy, Minister of State for International Cooperation, Zaki Nusseibeh, Minister of State, and Khalifa Saeed Sulaiman, Director-General of the Dubai Protocol and Hospitality Department. ABU DHABI, 24th January, 2018 (WAM) -- His Highness Sheikh Mohamed bin Zayed Al Nahyan, Crown Prince of Abu Dhabi and Deputy Supreme Commander of the UAE Armed Forces, today received Aga Khan IV, Imam of the Shia Ismaili Muslims, who is currently visiting the country. During the meeting, Sheikh Mohamed welcomed Aga Khan and exchanged talks with him on issues of mutual interest, especially with regard to the humanitarian, charitable and developmental projects that are being implemented in many countries, to improve economic conditions of people in need. They also affirmed the importance of coordination between government bodies, private institutions, and international organisations working in the humanitarian field to encourage development work in poor countries and help underprivileged people. Aga Khan praised the diversity of cultures in the UAE and the spirit of coexistence, rapprochement and tolerance among various communities living in the State. He appreciated the volume of humanitarian and charitable assistance provided by the UAE to many countries of the world. The meeting was attended by Reem bint Ibrahim Al Hashimy, Minister of State for International Cooperation, Mohamed Mubarak Al Mazrouei, Under-Secretary of the Crown Prince Court of Abu Dhabi, Yousef Al Otaiba, UAE Ambassador to the US, and Sultan Mohammad Al Shamsi, Assistant Minister of Foreign Affairs and International Cooperation for International Development Affairs, along with the delegation accompanying the Imam of the Shia Ismaili Muslims. ABU DHABI: His Highness Sheikh Mohamed Bin Zayed Al Nahyan, Crown Prince of Abu Dhabi and Deputy Supreme Commander of the UAE Armed Forces, on Wednesday received Aga Khan IV, Imam of the Shia Ismaili Muslims, who is currently visiting the country. Sheikh Mohammed bin Zayed, Crown Prince of Abu Dhabi and Deputy Supreme Commander of the UAE Armed Forces, met with the Aga Khan on Wednesday. They discussed ways to boost co-operation on humanitarian issues and development projects needed in disadvantaged areas of the world. 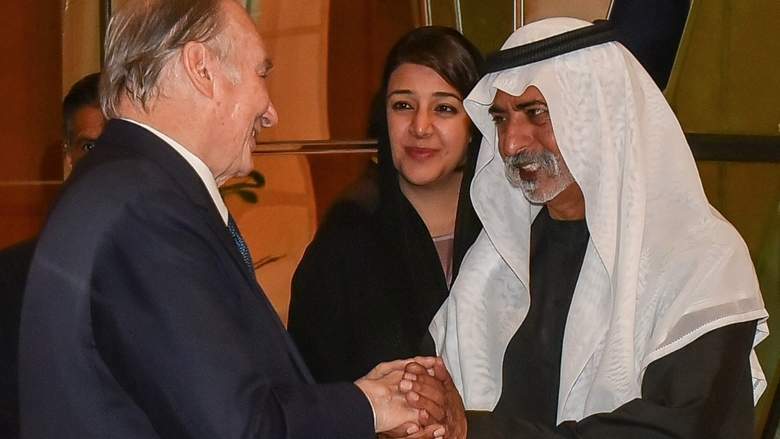 Prince Shah Karim Al Hussaini, is visiting the UAE as part of a diamond jubilee tour marking 60 years as spiritual leader of the Shia Ismaili Muslim community. The meeting was also attended by Her Excellency Reem Al Hashimy, Minister of State for International Cooperation. The leaders exchanged views on ways to expand areas of cooperation and coordination on development initiatives in countries of mutual interest around the world. Later in the day, His Highness Sheikh Mansour bin Zayed Al Nahyan, Deputy Prime Minister and Minister of Presidential Affairs, and Mawlana Hazar Imam held a meeting at the Presidential Palace where the two leaders discussed the history and achievements of the Ismaili community globally and shared assessments regarding world affairs and areas of further partnership. The meeting was followed by a luncheon hosted by H.H. Sheikh Mansour bin Zayed Al Nahyan in honour of Mawlana Hazar Imam's Diamond Jubilee. It was attended by H.E. Sheikh Nahayan bin Mabarak Al Nahayan, Minister of Tolerance, H.E. Reem Al Hashimy, H.E. Noura Al Kaabi, Minister of Culture and Knowledge Development, H.E. Abdulhamid Saeed, Managing Director of First Abu Dhabi Bank, and H.E. Mohammed Saif Al Suwaidi, Director General of Abu Dhabi Fund for Development. Tomorrow marks the final day of Mawlana Hazar Imam's Diamond Jubilee visit to the UAE. 2018-01-25 - H.H. The Aga Khan, Mowlana Hazar Imam, just landed in Paris after a busy trip in Dubai where he completed some AKDN work, met with Government officials and had several meetings with his Ismaili community for his Diamond Jubilee celebrations. 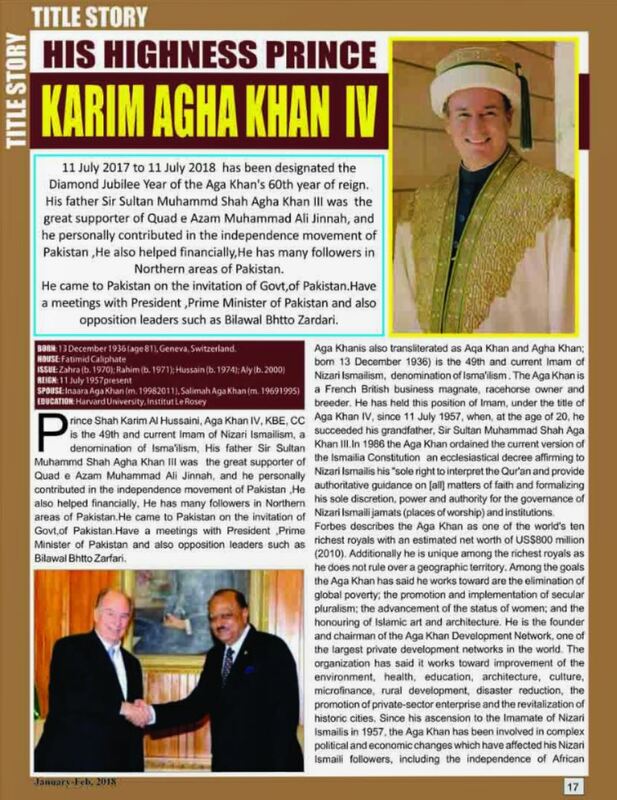 The World Salutes the pluralistic vision and actions of the Shia Ismaili community, who recently celebrated the Diamond Jubilee of His Highness Prince Karim Aga Khan. Tune in to find out more about the Aga Khan's beliefs in Pluralism as a crucial building block for creating peaceful and successful societies. In this exclusive interview we spoke to Mr Imran Maredia the Vice-president of Aga Khan Council for Australia and New Zealand. 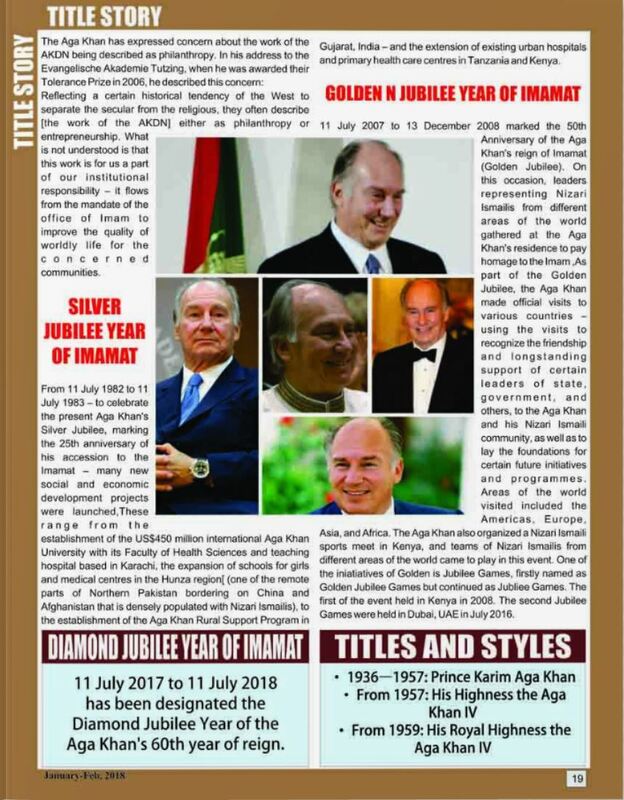 On 11th July, Shia Ismaili Muslims across Australia celebrated the Diamond Jubilee of His Highness the Aga Khan, marking his 60th year as their 49th hereditary Imam (spiritual leader). The celebrations were held in the Australian cities of Sydney, Melbourne, Adelaide, Brisbane and Perth and coincided with a homage ceremony, held at his Aiglemont residence in Gouvieux, France. At this event, His Highness addressed senior leaders representing the worldwide Ismaili community, including a number of Australian representatives. “I would like my followers to pursue the best education that can transform the individual and society toward prosperity and wellbeing. [This form of] education must promote social cohesion [and] individual wellbeing and… reinforce the value of peaceful coexistence in the context of the world in transition. This is the summary of the speeches delivered by Prince Karim Aga Khan during his visit to Pakistan in December 2017. The suggestions that the Aga Khan made in his speeches can potentially revolutionise our education system. His vision of education as a force for transformation provides a contextual and experiential perspective of knowledge production and the processes of outcome-based learning. The Aga Khan emphasised the need for quality education as the building blocks of a tolerant, peaceful and prosperous society. The Aga Khan Development Network (AKDN) has played an instrumental role in Pakistan’s education sector and provided quality education at the primary, secondary and tertiary levels. By raising the quality of life through integrated development programmes in remote areas like Gilgit-Baltistan and Chitral, the organisation has demonstrated the fact that development reflects a long-term engagement with socioeconomic change and involves processes of engaging with the possibilities of empowering individuals and pulling them out of poverty. Gilgit-Baltistan and Chitral have the highest literacy rates in Pakistan and have also produced some of the best development professionals and civil society activists. The Aga Khan’s commitment to contribute towards the transformation of the poor in Pakistan could enable the growth of integrated rural support programmes. The vision propounded by the Aga Khan reminds us of Paulo Freire’s concept of education as a pedagogical process of engagement with the real world to transform the conditions of oppression. Over time, we have put aside Freire’s conception of education because it potentially challenges our outmoded, ideology-induced education system of control and oppression. We live in a world where education has been reduced to a set of techniques and skills to acquire a job. The essence of education to transform human conditions has diminished. This has impacted our social, political and academic institutions. While the AKDN has an impressive record in social service delivery, it has been less vocal about human rights, advocacy and the rights of citizens in Pakistan. This is perhaps due to the fear of persecution and the element of pragmatism to deliver its primary mandate of bridging the gap between the supply and demand of basic services in poverty-stricken areas. With a life-cycle approach, the AKDN focuses on education as a process of life-time learning with varying approaches of pedagogy to different age groups. “The need for learning processes keeps changing and, therefore, we deploy a variety of approaches to ensure effective and outcome-based learning,” a senior official of the AKDN says. There are a number of lessons that we can learn from the network’s work to improve our educational system in Pakistan. As one of the key instruments of transformative change, education is central to the success of the network’s initiatives in the remote areas of Pakistan and across the developing world. What does transformation mean? When we look at our conventional curriculum of education and the pedagogical practices in our schools, it is designed to promote the homogenisation of borrowed values and the uniformity of thought processes. The education system kills the diversity of human thinking, creativity and the potential for critical reflection, which are the prerequisites for transformative change in societies. Our textbooks on history, geography and even science are ideology-driven and they strive to promote uniformity without unity, creationism without creativity, homogeneity as anti-diversity and scholasticism as anti-reason and anti-science. We are told nostalgic and ahistorical stories of the bravery and valour of our past heroes. This renders our present generation incapable to create a better world. Our education system promotes nihilism, hatred and an unfounded allegiance to an unthoughtful state ideology. State-run educational institutions strive to instil an ideological allegiance to the country, but this is done through a systematic and rational process of the social and political necessity of ideology. In our case, textbooks on history and Pakistan Studies build a narrative of anti-reason, with magical and miraculous attributes to our supra-historical heroes. In the process of doing all this, we have lost a wealth of perspectives, the capacity for pluralistic thinking and the capability to find the unity in diversity. Pakistan has diverse geographies, ethnicities and cultures that cannot be reduced to a single ideological narrative. The backlash of the singularity of the ideological narrative is visible through the growth of religious seminaries of diverse ideological pursuits, the private schools of Western education and the ethno-cultural schools of identity-based education. In the process of this ideological homogenisation and uniformity, we have lost the direction of nation-building. Our education system has restricted the human potential of transformative change and created a situation that Thomas Hobbes would call a “state of war of all against all”. There is a need to focus on local perspectives and varying geographical realities by devising a new curriculum that should promote diversity, pluralism as well as intercultural and interfaith harmony. It should promote conceptual learning, critical thinking and interactive pedagogical methods of education whereby cutting-edge knowledge and local wisdom become intertwined to synthesise a broad-based and contextual perspective. The National Education Policy of 2009 also highlighted that the diffused focus on the local context is a missing link in our educational policies. This suggests that we must compare our present educational policies with those of other countries where education has become a key instrument of social transformation. We live in a global knowledge society where fresh perspectives of learning disrupt the traditional ways of educating citizens. The means and mediums of education have also been transformed into a virtual world of simulated reality and if we fail to impart ethical, rational and value-based education to our youth, we will not be able to handle the influx of disruptive ideas. The AKDN could provide suitable assistance in revamping our educational system. If the vision of Prince Karim Aga Khan is internalised as a social policy framework, we may be able to works towards a better Pakistan. Alongside engaging with activities relating to the initiatives of the Imamat and the Aga Khan Development Network, Mawlana Hazar Imam will also meet with the USA Jamat. The announcement indicated that access to the Imamat visits will be restricted to the jurisdiction Jamat and that Mawlana Hazar Imam intends to continue granting Diamond Jubilee visits to other Jamats during 2018. Aga Khan IV, Imam of the Shia Imami Ismaili Muslims, is headed to India, five years after his last visit. The 81-year-old spiritual leader will be in Mumbai on February 28, and is scheduled to meet government officials and a congregation of his followers. During his visit in 2013, he had attended several religious ceremonies. In Mumbai, he will hold meetings with Chief Minister Devendra Fadnavis and Governor Ch. Vidyasagar Rao. Later, he is scheduled to attend a public function at a ground in Kalina, where more than 50,000 community members are expected to gather. Due to his visit, security in the area will be high, and community members have begun the process of obtaining special entry passes. This is also the diamond jubilee year of his leadership as the community’s 49th hereditary Imam. 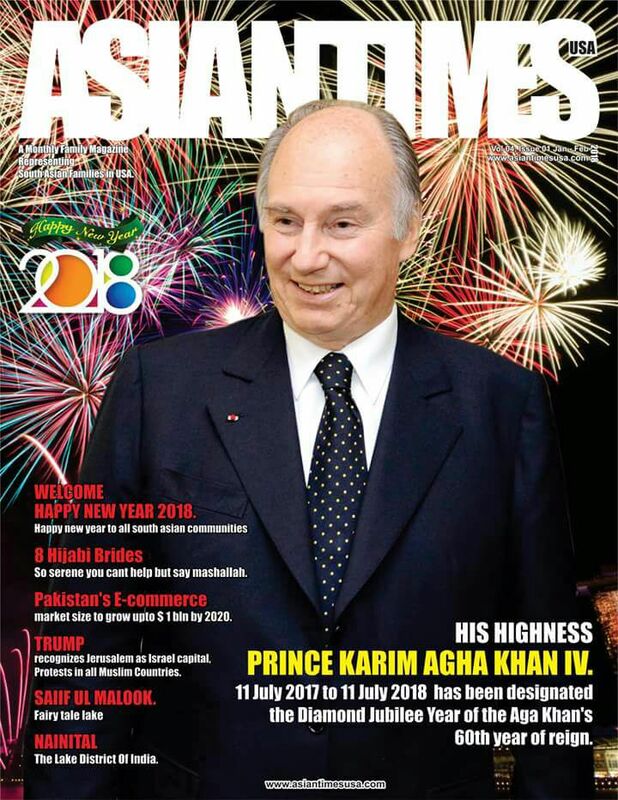 Aga Khan IV has been guiding the Shia Imami Ismaili Muslims since 1957 in religious, spiritual and temporal matters. He generally interprets the Quran and emphasises on achieving a better quality of education and life. His visit to India will begin in New Delhi on Tuesday. On Wednesday, he will inaugurate Sundar Nursery, a sixteenth-century heritage garden adjacent to Humayun’s Tomb in New Delhi. The 96-acre green patch was restored over nine years by the Aga Khan Trust for Culture (AKTC). Soon after the restoration of the Humayun’s Tomb, the Archaeological Survey of India (ASI) requested AKTC to take up the Sundar Nursery project. Long neglected, the nursery has now been converted into a beautiful green patch, and the 20-odd monuments it houses have also been restored. Apart from the ASI and AKTC, the multi-crore project has been funded by corporate and philanthropic organisations. The restoration of Humayun’s Tomb, including its gardens, is the largest cultural project undertaken by the Aga Khan Development Network (AKDN) till date. He is expected to visit Hyderabad and Ahmedabad as well. A project to restore the Qutb Shahi tombs is being implemented by AKDN in Hyderabad. New Delhi: Shah Karim Al Hussaini, the Aga Khan, will arrive here on Tuesday on an 11-day visit, during which he will hold talks with Vice President M Venkaiah Naidu, the Ministry of External Affairs (MEA) said yesterday. During his stay from February 20 to March 2, the Aga Khan will also meet President Ram Nath Kovind and Prime Minister Narendra Modi. He is visiting India on an invitation of the vice president. The Aga Khan is the founder and chairman of the Aga Khan Development Network (AKDN) and is the 49th hereditary Imam (Spiritual Leader) of the Shia Imami Ismaili Muslims. Sunder Nursery, a 90-acre park near Humayun's Tomb here, will be inaugurated by Naidu in the presence of the Aga Khan on February 21, the MEA said in a statement. The park, a part of the Nizamuddin Urban Renewal Initiative, is a partnership between the Aga Khan Trust for Culture, Aga Khan Foundation, Central Public Works Department, South Delhi Municipal Corporation and Archaeological Survey of India. In addition to these engagements, the Aga Khan will be visiting Ahmedabad, Hyderabad and Mumbai, where AKDN is involved in various development projects. Hussaini was conferred Padma Vibhushan by the then president Pranab Mukherjee for his contributions to social development in India during his previous visit to the country in 2015. On an invitation from Hon’ble Vice President, His Highness the Aga Khan is visiting India from 20 February - 2 March, 2018. This year marks the Diamond Jubilee of His Highness’ leadership. His Highness will hold talks with Hon’ble Vice President on 21 February 2018. The Aga Khan is visiting India to commemorate the Diamond Jubilee of his Imamat. On February 21, he is also scheduled to inaugurate the Sunder Nursery in Delhi. The Aga Khan, the 49th Imam or spiritual leader of the Shia Ismaili Community, currently on a visit to India, is scheduled to call on the President, the Vice-President and the Prime Minister over the coming week. On February 21, he is also scheduled to inaugurate the Sunder Nursery in Delhi. The Aga Khan is visiting India to commemorate the Diamond Jubilee of his Imamat. The Sunder Nursery is a 16th-century heritage garden complex adjacent to the Humayun’s Tomb, a UNESCO World Heritage site in Delhi. Originally known as Azim Bagh, it lies on the Mughal-era Grand Trunk Road and is currently spread across 100 acres. The complex is being restored as part of the Aga Khan Historic Cities Programme. Festivities are taking place across the country, including decorating Jamatkhana buildings, traditional dandia-raas, and other cultural events and highlights, reflecting the Jamat’s excitement and unity in anticipation for the visit. In preparation for Hazar Imam’s arrival, students of the Jamat participated in Jalsa, an event held to showcase and express their creativity and artistic ability. Inspired by news of the visit, students of all ages came together in a celebration of colour and collaboration that warmed the heart. Mawlana Hazar Imam will arrive in India at the official invitation of the Indian government. During the ten day visit, he is scheduled to attend the inauguration of Sunder Nursery in Delhi, alongside other activities relating to Imamat and AKDN initiatives in India. Mawlana Hazar Imam is also expected to meet with the Jamat in various regions of the country, and grant a Diamond Jubilee Darbar. To stay informed of all the latest news before, during, and after the visit, follow us on social media (Facebook, Twitter, Instagram, Snapchat) and sign up for email updates. Mawlana Hazar Imam’s visit is at the official invitation of the Government of India, and coincides with the commemoration of his Diamond Jubilee. During his stay in the country, he is expected to meet a number of national and state government representatives, and is also scheduled to attend the inauguration of Sunder Nursery in Delhi tomorrow, 21 February. The Sunder Nursery is a 90-acre city park in Delhi, adjacent to Humayun's Tomb, a UNESCO World Heritage site. The 16th century heritage garden complex has undergone restoration by the Aga Khan Trust for Culture, as part of the wider Nizamuddin Urban Renewal Initiative. The project has significantly contributed to the improvement of the quality of life for people in the area, while creating important new green spaces for the people of Delhi and beyond. Mawlana Hazar Imam is also expected to meet with the Jamat in various regions of the country, and grant a Diamond Jubilee Darbar. Hazar Imam last visited India in 2015, when he was bestowed with the Padma Vibhushan, one of India's highest civil decorations, in recognition for his contributions to social development in India.